Scrambling to get the Barclays Center in operating shape--if not final shape--in time for the grand opening on September 28, Forest City Ratner officials today acknowledged that they were behind in what was already a tight schedule. The "substantial completion date," when the arena would get a temporary certificate of occupancy (TCO) from the city Department of Buildings has been nudged back several times, in April 2011 from Aug. 12 to Aug. 27, and in February 2012 to Sept. 5, yesterday. And even though the construction monitor for arena bondholders, Merritt & Harris, has dutifully reported that Sept. 5 date, most lately in a report dated 8/7/12, now the goal is sometime next week. Indeed, the final completion date is 6/30/13. 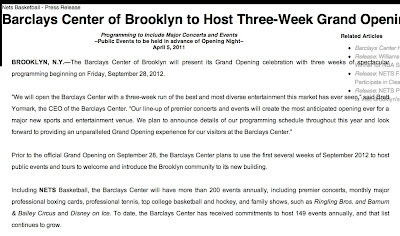 Prior to the official Grand Opening on September 28, the Barclays Center plans to use the first several weeks of September 2012 to host public events and tours to welcome and introduce the Brooklyn community to its new building. No public events and tours have been announced to the public as of yet, and the first several seeks are already upon us. This morning, Jim Vogel, a staffer for state Senator Velmanette Montgomery, raised the issue: "There was a discussion of pre-opening events--it was some months ago, there would be pre-opening events to familiarize the community and the press... I know it's tight, can you give us an update on what’s going on with that?" 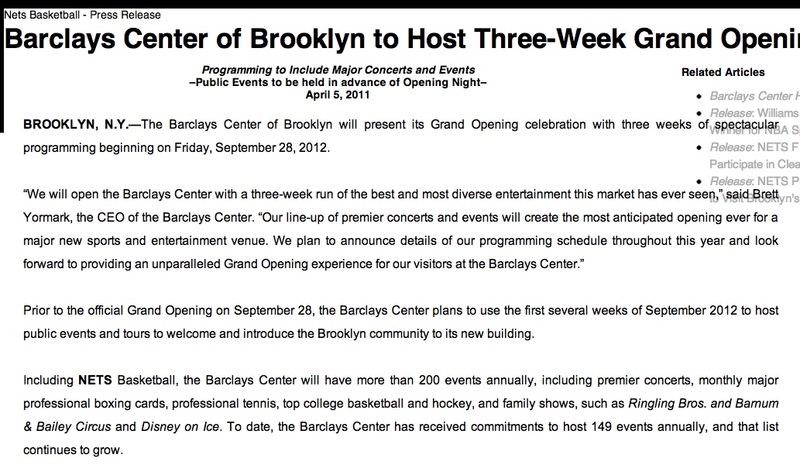 It wasn't clear how many--if at all--"public events and tours" will be used to "welcome and introduce the Brooklyn community" to the building. But I'd bet they'll have at least one event during that final week of the month.